You can use Morpholio Trace 2.0 to quickly sketch design ideas over photos, like this one of downtown Bloomington, Indiana. Credit: Lohren Deeg. The design process will always feature pen and trace—at least to some extent. But there’s an assortment of apps coming on the market to try to dethrone the old tools designers use for ideation. Morpholio Trace 2.0, developed for the iPad, is currently your best bet for quick sketching and layering with its breadth of capabilities geared to designers. As project schedules tighten aggressively and clients’ delivery expectations keep rising, Trace 2.0 offers dependable ways to improve efficiency, clarity, and communication throughout the design process. You can use it to dash off a concept, illustrate an image, or add markups to drawings, and then show anyone the latest version of your work. In the May issue, we focus for the first time on lighting and landscape with the work of dynamic lighting designers in collaboration with landscape architects. We look at projects by M. Paul Friedberg with MCLA, Ken Smith and SHoP with Tillotson Design Associates, PWP and Michael Arad with Fisher Marantz Stone, WRT and L’Observatoire International, and OLIN with Tillett Lighting Design. There’s also a how-to on Morpholio Trace 2.0 in Workstation, and new research on sin-free lawn grasses. Marcel Wilson talks about his young practice, Bionic. And a graphic designer takes us through the vanishing world of urban typescapes. All this plus our regular features in Species, Books, and Goods. This month’s ASLA CES is on Soils for Landscape Architecture Projects. You can read the full table of contents for May here. As always, you can buy this issue of Landscape Architecture Magazine at more than 200 bookstores, including many university and independents, as well as at Barnes & Noble. You can also purchase single digital issues for only $5.25 at Zinio that can be read on your desktop or mobile device. Annual subscriptions for LAM are a thrifty $59 for print and $44.25 for digital. Our subscription page has more information on subscription options. 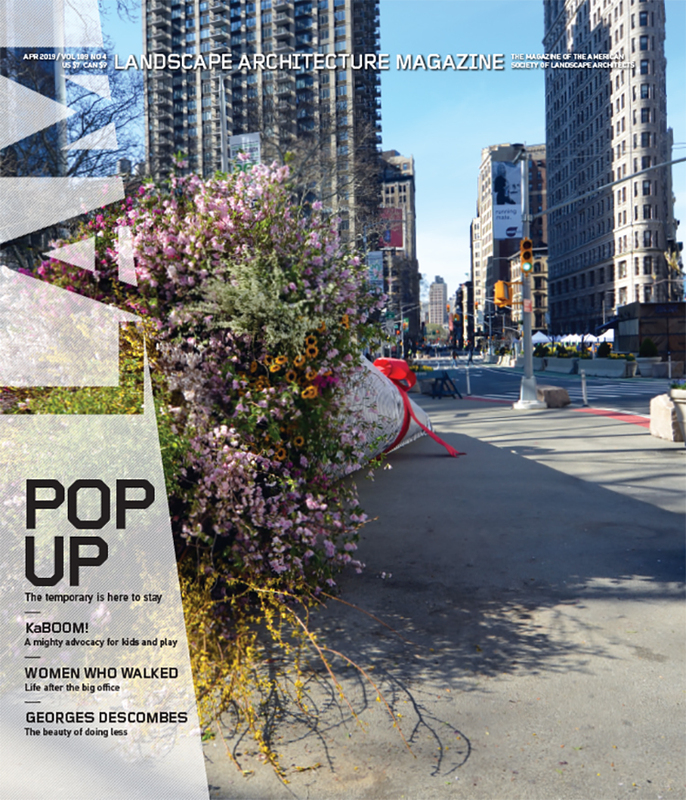 Keep an eye on the LAM blog, Facebook page, and Twitter feed (@landarchmag), as we’ll be ungating some May pieces as the month rolls out. Credits: 9-11: Courtesy Fisher Marantz Stone; SteelStacks: Emile Dubuisson for l’Observatoire International; East River: John Muggenborg/www.johnmuggenborg.com; Syracuse: Steven Satori, Syracuse University; Yards Park: David Galen; Dam: MKSK; Morpholio Trace: Lohren Deeg, ASLA; Turf: Suzanne O’Connell; Owls: Courtesy travelwayoflife/wikimedia commons; 50K Trees: Sarah Moos, Associate ASLA. Want to show off your rendering skills? Nemetschek Vectorworks and MAXON Computer GmbH are sponsoring the 2012 Inspired Visions Global Rendering Competition, which is open to both students and professionals. To qualify, models must be created in Vectorworks and rendered using Renderworks or CINEMA 4D. Awards are offered in a number of different categories, and the winners will each receive $2,500. If you are interested in competing, but don’t have the most recent version of Vectorworks with Renderworks, you can request a free 30-day trial of the software here, or, if you are a student, here. A free 42-day trial of CINEMA 4D is also available. For more information about the competition, you can visit its web site. All entries must be submitted by August 16, 2012.